The CDT test measures the carbohydrate-deficient transferrin (CDT) blood level. What is a CDT Test? The CDT test is a blood test that measures the level of Carbohydrate-deficient Transferrin, Transferrin and %CDT levels. Why is the CDT test important? The CDT test is often elevated after heavy alcohol use (4+ drinks per day for two or more weeks). This CDT Test is a blood test. The CDT test, also known as a CDT lab test, CDT level test, and a carbohydrate-deficient transferrin test, measures the CDT blood level. The CDT blood test is used as a way to check for heavy alcohol ingestion over the past two weeks. The CDT lab test is often used as a way to check for compliance with alcohol abstinence programs in heavy drinkers. 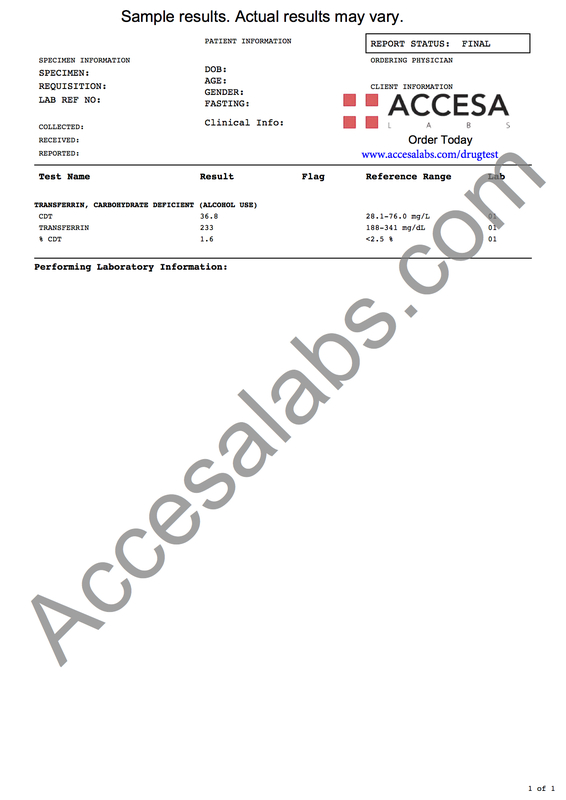 This test makes use of a glycoprotein called transferrin that is made by the liver. After daily consumption of five or more alcoholic drinks, the liver starts producing transferrin that is lacking their normal carbohydrate (i.e. sugar) molecules. Lacking carbohydrates, the amount of "carbohydrate-deficient" transferrin molecules as a percentage of all the transferrin molecules can be used as a marker for heavy drinking. Typically, a CDT blood test percentage of greater than 2.6% is associated with recent heavy drinking. It is helpful to note that the CDT level is not as useful for an assessment of more casual, recent alcohol use when compared to the EtG test or alcohol urine test. To get a CDT test near you, just order online and get your blood drawn at the selected Quest Diagnostics lab. Once the CDT lab report is ready, it will be available for download. As can be seen on the sample CDT lab report, the CDT blood level, transferring level and % CDT will be reported as numbers which can be compared against the reference ranges provided by the lab. CDT Test at Guaranteed Prices.